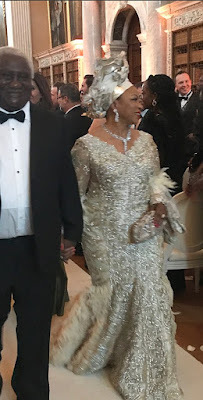 His mother is the world's richest black woman so it's little surprise that Folarin Alakija's wedding was a lavish, no-expense spared, fairytale affair. 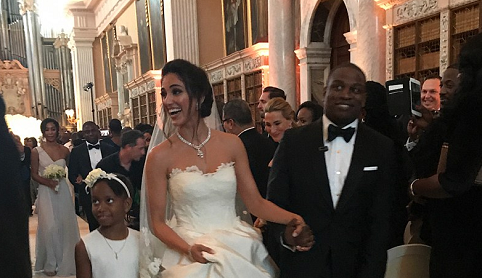 Folarin, who is one of 66-year-old oil tycoon Folorunsho Alakija's four sons, married Iranian beauty Nazanin Jafarian Ghaissarifar in an extravagant bash at Blenheim Palace in Oxfordshire over the weekend, which is estimated to have cost around £5m. 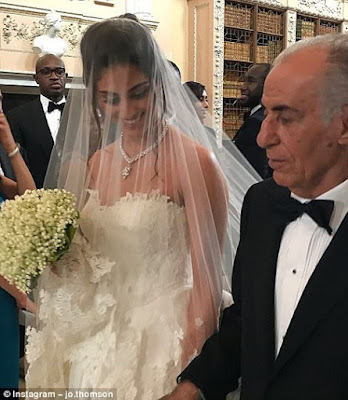 The father-of-one, who lost his first wife - a white lady - to cancer, tied the knot to his stunning wife in front of friends, family and celebrities, including Victoria's Secret Angel, Shanina Shaik. While Folarin makes his money as an entrepreneur, investor and cinematographer, it's his mother who has an estimated fortune of $2.1 billion. Forbes rank her as the 14th richest person in Africa but the richest woman in Africa. She is number 80 on its global Power Women list and overtook Oprah Winfrey as the richest woman of African descent in the world in 2014. It is thought the family flew hundreds of close friends and family members over from Nigeria, who were no doubt put up in the lavish hotel for the weekend. 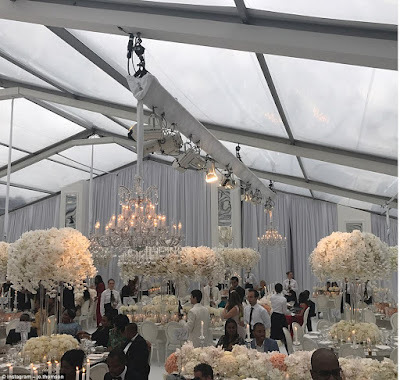 Wedding planners believe the venue hire was exclusively hired at a cost of £150,000 with the bespoke marquee and marble floor and production costing around £200,000 on top. According to the venue's website, the cost of hiring the whole venue is on application but hiring just the palace and state rooms costs £33,000. Searcys are the approved caterer for the Orangery at Blenheim palace and three course meals start at £52 per head - excluding alcohol - but it's believed they had a much more expensive bespoke package. 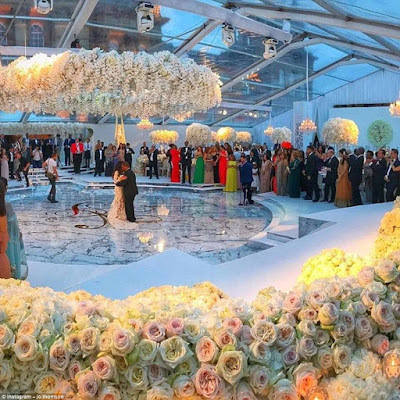 The breathtaking flowers were the work of Jeff Leatham, who is known for his elaborate decorating of the Kardashian's homes. 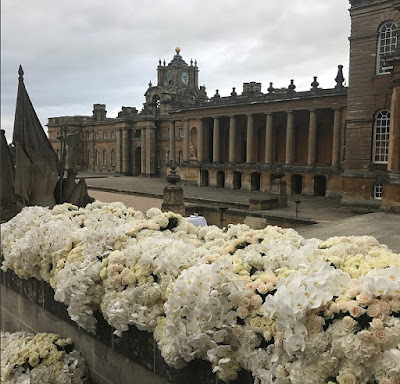 Bringing over 30 staff members to the UK for the ceremony, Jeff adorned every inch of the venue with copious amounts of roses and white orchids. Jeff, who can command up to £250,000 for flowers, has worked for Madonna, Oprah and Tina Turner. 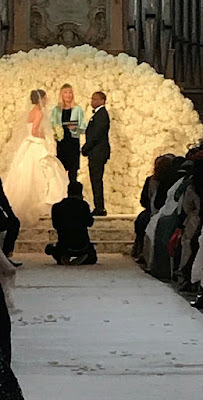 He was also the man behind the flowers at Eva Longoria and Tony Parker’s wedding. Guests were also treated to a surprise performance from Blurred Lines singer Robin Thicke, who reportedly costs around £150,000 to hire and would have been flown over from the US, as well as a magnificent firework display in the hotel grounds later in the evening. Folarin's new wife, who once dated Rob Kardashian, studied Bioengineering and Biomedical Engineering at the University of Manchester, has a graduate Diploma in Law and has also worked as a model and marketing consultant. The stunning brunette is the daughter of businessman Mr. Khosro and Mrs Nooshin Ghaissarifar, who are from Iran. It is believed that Naz, as she is known among her circle, lived in London in her youth and moved to Manchester to study. She has also spent time in Los Angeles, where much of her modelling work was based, and regularly mingled with celebrities, including the Kardashians. Folarin, who studied Geography at Imperial College, London, was previously married to a white lady named Chena, with whom he had a daughter. She tragically lost her life to cancer six years ago. It is believed that Folarin met Naz through friends in London. The new Mrs Alakija has previously featured in a campaign for Monkee Jeans, an organic denim brand, and dated Rob Kardashian in 2013. She later changed into a racier, floor length white gown with sheer panelling. Beaming before her friends and family, she let her hair down as she danced the night away with her new husband and glamorous wedding guests. The cake, which was adorned with hundreds of roses and ornate doves, was created by Elizabeth’s Cake Emporium. Prices start at £300 per tier and Elizabeth's clients include British, European and Middle Eastern Royalty, celebrities and high net worth individuals. With eight tiers on their cake, the base price would be around £2,400 - and that's excluding the elaborate iced flowers and doves. Elizabeth is also the only three times winner of The Great Cake Bake, a show which featured the best wedding cake makers in the country. The event was planned by Sade Awe of The Bridal Circle. Sade’s impeccable taste and selective eye for the exquisite make her a trusted resource for an elite clientele and luxury partners alike so it was little surprise she was called upon. Other famous faces at the event included Starboy Records artist Mr Eazi and Nigerian fashion Forumger Temi Otedola, who were recently revealed to be dating. Hamish Shepard of Bridebook.co.uk, said: 'The preparations and construction of their custom clear marquee, including a bespoke marble floor with their gold initials, would have required up to a week of exclusive hire of the Palace, with the cost of the marquee on top." 'Venue hire would likely be up to £150,000 with the bespoke marquee with marble floor and production around £200,000 on top.